Cheers to Beer Month in Raleigh, N.C.! In celebration of N.C. Beer Month 2016, the Raleigh area&apos;s 22 breweries, bottle shops and craft brew restaurants are going all out to support local craft beer and give visitors, and residents, even more reasons to raise their glasses. 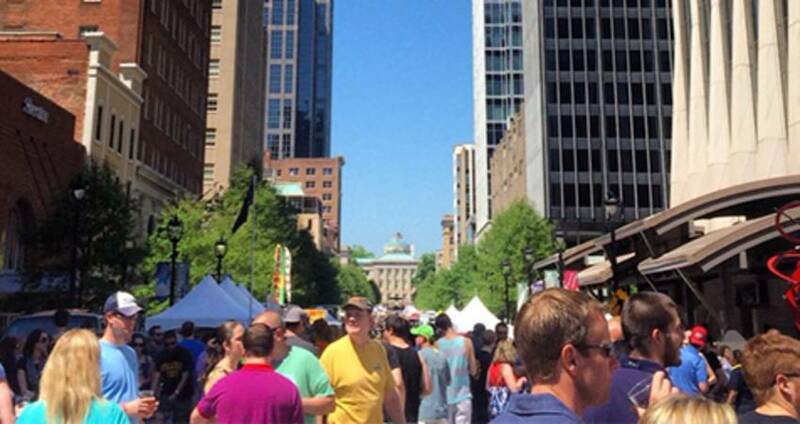 Beautiful Raleigh spring weather and delicious local brews have proven to be a winning combination, and April beer festivals have become a staple here. It&apos;s easy to spend an entire day (or a full weekend) drinking in the excitement, but these are the beer festivals that have taken things to an entirely new level that you need to know about. World Beer Festival Raleigh is all about BIG! Big venue, big crowds and big tastes. Held at the North Carolina State Fairgrounds for the first time for 2016, this festival gives you a chance to sample more than 250 craft and specialty beers from around the world. Interested in a more local experience? The N.C. Beer Garden section at the festival has more than enough to keep you busy, showcasing our home state&apos;s best brewery offerings so you can revisit old favorites or discover new ones. Those with dietary restrictions may appreciate a new feature at the festival this year—the Cider Garden will have more than 20 different gluten-free cider options on hand to sample. Need to know: no person under the age of 21 is allowed at the event. What&apos;s not to like? Two of our favorite things in one festival at Koka Booth Amphitheater make for a perfect way to spend a day in Cary. Grab your souvenir glass and get to tasting the more than 75 international beers and wines on hand, and dig into some of the two tons of gourmet bacon from 10 vendors across the country that will be griddled on-site! Trial By Fire and Kasey Tyndall will be providing the live music, and you won&apos;t want to miss out on the bacon eating contest! Items to bring: blankets, chairs, a good mood and a designated driver! Featuring craft breweries from N.C., plus local food trucks, vendors, and bands, the ever-popular Brewgaloo has added an extra day to the festival for 2016. The new Fri. night portion of the event, an exclusive chance to sample some of N.C.&apos;s best beers, will be open from 6-10pm and requires a separate ticket. The Sat. event, from 2-10pm in downtown Raleigh&apos;s City Plaza, gives you the option of purchasing either beer samples or full pints from more than 75 N.C. breweries. One reason Brewgaloo is a favorite event for residents and visitors? More than 50 local food trucks will be on hand, serving up the perfect grub to pair with cold brews. Need to know: no admission fee to enter the festival on Sat., so bring extra friends to hang out (plus a designated driver)! This Beer Month kick-off party at Crank Arm Brewing features unique casks from more than 20 Raleigh area breweries. This annual Earth Day music festival is free and family-friendly with three music stages and beer from Raleigh Brewing Company and more. A jam-packed day of barbecue from The Pit, local brews and toe-tappin&apos; bluegrass music. A day of live music from the likes of Katelyn Read and Jack the Radio, plus beers on hand from Big Boss Brewing Company and more. See a full calendar of Beer Month events in Raleigh here.